Mars at night -- big and bright deep in the heart of Texas? This weekend I received a forwarded email from a relative claiming that Mars is going to be so close to Earth and so brilliant on August 27, 2007, that it will be like Earth has a second moon. Unfortunately, this email is four years old and still flat out wrong. Mars, like the Earth, orbits the sun in an ellipse (kinda like an oval). The Earth's orbit is very nearly circular. Every January, the Earth is 92 million miles from the sun; in July, the Earth is 94 million miles from the sun. That change is so small, we don't notice it on Earth. Mars, however, has a more elliptical orbit. At its closest to the sun, Mars is about 130 million miles from the sun; at its furthest, it is 155 million miles away from the sun. 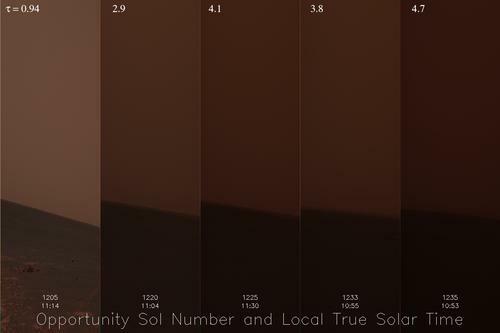 That difference is big enough to be noticed on the planet; the big dust storms now threatening our Mars rovers only happen when Mars is closest to the sun (which it is now). But Mars being closest to the sun doesn't mean it is closest to the Earth. The Earth orbits the sun faster than Mars, and so can be elsewhere in its orbit when Mars is closest to the sun. This animation shows how the position of the Earth and Mars change relative to the sun and relative to Each other. On August 27, 2003, the Earth and Mars were as close as they had ever been in recorded history. This is just because of geometry, and both planets happening to be at the right places in their orbits (you can play with the animation to see how this happened). At its closest in that year, Mars was about 35 million miles (56 million km) away from the Earth (exactly, it was 34,646,418 miles away). Even at that "small" distance, though, Mars did not look like a second moon to the Earth, as the email I received claims. It looked like a really bright star, unless you had a telescope, in which case Mars would look impressive compared to normal, though still smaller than Venus and Jupiter appear through a telescope. This is quite far from being a "second moon" to the Earth! This year, Earth will again be relatively close to Mars, but not until December 18, when Mars will be 55 million miles away (88.42 million km). And, Mars will only be about half the apparent size it was back in 2003. This email has turned up every year since 2003. It was mostly wrong then, and it is even more wrong now. So, if you get an email like this, please don't forward it to everyone you know. If you get an email with astronomy news you are uncertain about, feel free to drop me an email, and I'll let you know if it is real. You can also look for yourself at The Urban Legend Reference Pages or at the Bad Astronomy website. Yesterday was not a good day for human exploration of space. A report was released suggesting that some astronauts may have been drunk when they were launched into space, NASA announced that a computer destined for the space station had been sabotaged, and an explosion at the Mojave Air and Space Port killed three people during testing of an engine for Virgin Galactic's SpaceShipTwo rocket. The timing of these three events is unfortunate, but certainly unrelated. The story of the allegedly drunk astronauts is part of a new study into astronaut health and mental health that NASA had commissioned, such a study is long overdue and needed. If it uncovers problems, that is a good thing -- these problems can be corrected before they cost astronauts their lives. It should not surprise us that astronauts are human, too. We ask them to do amazingly courageous acts on a continual basis; we should not be surprised that these people are not superhuman at some level. The sabotage of a computer is more worrisome. Yes, it is good that it was caught, and that the computer would not have controlled any vital functions. But why somebody would do such sabotage is the question of the day. We'll need to let investigations run their course here. But, again, it is best to catch these problems now, before anyone's life is in danger. The explosion of a rocket motor being tested by Scaled Composites for SpaceShipTwo was, in my opinion, the worst news, precisely because three people were killed. I hope that SpaceShipTwo will be made all the safer by this horrible accident, and my heart goes out to those who lost loved ones in the explosion. We need to realize that private spaceflight is a new field, lots of new ideas are being tested, and bad things are going to happen. People will lose their lives in pursuit of mankind's dream to fly in space. I hope that these accidents will not scare us into staying firmly rooted on the ground, but spur us to new heights of exploration. No, I'm not testing the blog, which is working fine (as far as I know). But my computer has spent the last week testing some of my analysis of white dwarf stars, finally finishing this morning. Testing your own analysis is hard and incredibly boring. It involves doing the same task over and over and over again under slightly different situations to see how robust your answers are. It involves re-analyzing data by adding a little bit of static noise to see if that changes your answers in the way you expect. And it involves comparing one's own work to those of other people, to see if you get the same answers for the same objects. And, at the end, chances are we haven't learned anything new about the Universe due to this testing. What we have learned is how accurate our answers are. And this is just as important as learning new things about stars and galaxies. Suppose I were to claim that I discovered a new type of star, and then somebody else were able to show that it was just some spurious noise in a picture, kind of like a "pop" you might get when listening to AM radio or a phonograph record. I would be embarrassed, and others would be less likely to believe my work. But if I were able to show that the "pop" is 99.95% certain to be real, and then I show all of my tests to prove it, it is both more likely that I am correct (because I understand the possible errors and tested each one), and more likely that people are going to believe me (because my work shows I am a careful scientist). So, I'll slog on through more testing for the rest of the week. It takes far more time to do this error testing than it does to come up with the results that I am testing. But it is so vital, I'm willing to be bored for a few weeks, especially if it means that, at the end of the day, I get the right answers. The Martian rovers Spirit and Opportunity are in trouble. Having long outlived their mission goals of 90 days on the surface of Mars (Spirit is now at 1263 days, Opportunity at 1242), the rovers are threatened not by mechanical problems, but by Mars itself. Mars is a forbidding place. Despite dreams of "terraforming" the planet into a future paradise, it is far from paradise now. Mars is bitterly cold (temperatures a hundred degrees below zero or more), is covered in a very alkaline dust (which tends to be corrosive), and it is subject to dust storms that envelop the entire planet. A few weeks ago, one of those dust storms started. It began as a regional storm (like a frontal system on Earth), but has blossomed into a planet-encircling storm. If you look at the weather movies taken by spacecraft orbiting Mars, you can see huge clouds of dust moving across the face of Mars. As both rovers are solar-powered, they need sunlight for electricity, and they need electricity to run not only science instruments, but heaters that keep the joints of the spacecraft from freezing in the Martian cold. The picture above shows the view of the horizon seen by Opportunity from its perch next to a crater on Mars. You can see how it has gotten much darker as the dust storms have progressed. As of a few days ago, only 0.5% of the sunlight normally hitting the surface was getting through unhindered; a larger amount was still reaching the ground. The situation is like a foggy morning -- there is light to see and light to power the solar panels, but it is much darker than normal and hard to see very far. The Mars rovers may very well not survive. If the dust stays this thick, the batteries will slowly drain due to the needed heaters, and the rovers will fall silent. If it clears, both rovers may still be in perfect health. Opportunity is ready to journey into its biggest crater yet, where it may see millions of years worth of rock and water action from early Mars. We don't know when the storms on Mars will subside. Sometimes these storms last only a few weeks, sometimes a month or more. And even then, it will take weeks for the dust to settle enough that plenty of sunlight is reaching the ground. You know how bad weather forecasts on the Earth can be; now imaging trying to forecast what is going to happen on another planet when we don't know the temperature, wind speeds, atmospheric pressure, or any of the numerous things that could be driving the Martian weather. Even if the rovers do fall quiet, they have far exceeded their design goals and any expectations we had for them. And for that, we should be very happy. Earlier this week, Robert Quimby, a postdoc here at the University of Texas, received an email informing him that he had won a share of the Gruber Foundation Cosmology Prize. After scrutinizing the email to make sure it was not spam, Robert learned a bit more about the award. The Gruber Foundation is a philanthropic organization that hands out several awards each year in the fields of cosmology, genetics, neuroscience, justice, and women's rights. The foundation has teamed up with the International Astronomical Union to award the cosmology prize each year to groups that have made tremendous impacts upon the field of cosmology. Unlike the Nobel Prizes, which can only be awarded to individuals (and a maximum of three individuals), the Gruber Prize was awarded to two separate teams, each consisting of dozens of astronomers (a total of 50 astronomers in all!). The teams were able to provide some of the first strong evidence that the rate of expansion of the universe is accelerating, not slowing down as we expected it would be. This observation has been interpreted as "dark energy," or some strange energy that seems to pervade the Universe. We don't know what dark energy is or how it works, but it seems reasonably likely that it exists. Now, though, comes the "fun" of trying to determine how to use or divide up the prize money. I don't know whether each group will divide up their share or apply it to their respective research projects. Does each astronomer get a share? Does the size of the share depend on their contribution to the team? Frankly, I'm quite happy NOT to be part of that mess. But, congratulations to both teams, and to Robert, for their award. Their research is certainly deserving of such recognition. As I promised last week, I have put up some pictures from the science teacher continuing education workshop I helped to run at McDonald Observatory. If you want to see the fun we had, the pictures are here. The workshops are arranged so that we have classroom activities during the day (these activities are designed by educators here at McDonald for the teachers to take back to their classrooms, and these activities fulfill Texas state physics education guidelines), and then in the evenings we would have dinner, take a tour of a telescope before sunset (which was at 9pm), and then use a couple of small telescopes for the first part of the night. Since most of the teachers are used to waking up with the chickens and going to bed early, by midnight most of our group was exhausted and ready to pack it in. This year's group had some bad luck with the weather, as we were only able to use the telescopes on two of the four nights. But I think they made the best use out of the time they had. And, hopefully, some of the teachers will carry these activities back to their classrooms. That is the entire goal -- to spread our knowledge of the Universe as far and wide as we can, and to help young people gain a better understanding of science . In the University world, summer tends to be when the most dramatic changes happen. New people come, other people leave. We very much follow the academic year, mostly out of necessity. Our main mission is the education of college students, and so we have to plan ahead and be fully prepared come the first day of classes. Although my situation is not changing, much is going on around me. A couple of well-liked postdocs are taking off for new jobs, and a few new postdocs will be arriving. The graduate students who finished their dissertations are starting to leave for their new postdoc positions; new graduate students are starting to arrive to begin their studies. The chair of our department will be leaving on a year-long sabbatical in a few weeks, meaning there will be a new person taking over the role of chair and starting to put their stamp on the department. And so, the department that existed at the end of the spring semester will have changed, in some ways subtly, in some ways dramatically, when the first student arrives for class at the end of August. And, for once, I can sit back and watch and wait to see what happens! Earlier this week, astronomers using the Keck Observatory announced that they have seen the most distant galaxies yet known. And, since looking further away is looking backward in time, these galaxies are also our first glimpse of the first galaxies forming. These galaxies are so far away that their exact distances are hard to determine and depend on our understanding of the evolution of the Universe. We think these galaxies are about 13.2 billion light-years away; the light we see has been travelling since the Universe was "only" 500 million years old. How can we even see so far away? These galaxies are all located behind massive clusters of galaxies. The combined gravity of thousands of galaxies and loads of dark matter acts as like a giant telescope, focusing light from these galaxies and magnifying the images. With the largest telescopes on Earth, we can just barely see the light from these galaxies. In fact, it is so hard to see them that we can't be sure that these galaxies are not actually much closer and very faint. For various reasons the discoverers of these galaxies are pretty sure that they are very distant, but they could be many times closer. The importance of this study is not the detection of the most distant galaxies in the Universe. More important is that these galaxies tell us that the Universe was making stars in a very short amount of time after the Big Bang. It is difficult for theories of the Universe to produce stars this early, so detection of galaxies at such a time helps push the theories to work harder to reproduce what we see. This doesn't mean that we don't have a good understanding about the Big Bang, though. We understand that quite well. What we don't understand well is how clouds of gas collapse to form stars, especially stars in the early Universe, when conditions were much different than they are in our own Milky Way. So any new observations, such as these very distant galaxies, helps us to push the bounds of understanding further. It tests our existing hypotheses, and forces us to develop newer and cleverer ideas that can explain what we see and make predictions for the next generation of telescopes to test. Back in February, I wrote how two planets around other stars didn't seem to have any water. Since that time, two other studies, including one announced yesterday in the prestigious journal Nature, have contradicted this claim, saying there are "clear signs of water." Who is right? I haven't read the papers in detail, though it wouldn't surprise me if there is lots of water in these planets. Water is very common in the Universe, as are its constituent parts -- hydrogen and oxygen. But it is possible to hide the signatures of water. Indeed, the reason water was not seen in the first studies of these planets seems to be that the atmospheres of these planets are very different from atmospheres in our solar system. Unlike on Earth, where the temperature of the atmosphere gets colder as you go higher, in these planets, the temperature seems to be fairly constant. When astronomers look at the spectrum of light from a star or planet to figure out what it is made of, we rely on physics that requires the lower parts of the atmosphere to be warmer than the upper parts. If the temperature stays the same, then the physics we rely on doesn't hold, and other techniques are needed. This goes to show that studying planets around other stars is very hard. Many claims are going to be made that end up being wrong. This is how science is done -- observations are made, hypotheses (educated guesses) are created to explain those observations and make predictions, and then the new predictions are tested. It's quite okay for scientists to be wrong at first, because the scientific method allows us to zero in on the truth. And in new fields, like planets around other stars, there is often little evidence to base these hypotheses on. So, we are bound to be wrong, and probably quite spectacularly wrong, and probably quite often wrong. The only thing that worries me is that a lot of science is announced these days by press releases as well as through traditional journals. Often, press releases are meant to show off flashy research that, if right, is pretty important. Unfortunately, this flashy work is often wrong. Again, this is normal -- it's part of science to be wrong, as long as the right answers are found -- but the corrected analysis rarely turns into a press release. And so the public wonders why, a few years later, what they thought was true about astronomy is completely wrong. Press releases bring prestige to researchers and universities, but although they are also intended to keep you all informed of what we are learning about the Universe, I think it does a disservice when these releases are dramatically wrong. As I mentioned in my last post, since July 6 I have been helping with a continuing education workshop for science teachers. The workshop, held here at the McDonald Observatory, is hosting 15 teachers from as far away as Kentucky and Oregon. Unfortunately, at the end of the second day of the workshop, I came down with a very nasty stomach bug (one that nabbed a couple other astronomers and several people in the nearby town of Ft. Davis, TX), and I spent the 7th of July hiding in my room. Yesterday I was able to help out again, though with a nap break in the afternoon. Thankfully, the two other facilitators for this workshop are more than capable of keeping things running, and the teachers are having a great time and learning lots of astronomy and classroom activities. In the coming days I should have a few pictures to share. These workshops are important. McDonald hosts several workshops each summer, each geared toward teachers of a specific age group, from Kindergarten up through high school. In the present day, when standardized testing topics dominate the curriculum in most public schools, it can be hard for teachers to introduce "non-essential" topics such as astronomy. In each of these workshops, we present activities designed in coordination with educators. These activities present astronomy in ways that fulfill required science curriculum topics, often by teaching the physics that underlies every aspect of astronomy. Our hope is that these teachers will take the activities we perform with them back to their classrooms and incorporate them in to their science lesson plans. Many students appreciate seeing how the basic physics they are learning is still being used in cutting-edge scientific research. And, of course, we hope that these plans will keep astronomy in the eye of students throughout their education. Tomorrow I will be traveling out to McDonald Observatory again, so it may be a few days before my next post. One of astronomer's least favorite topics to talk about is time. Not time as in, "What time is coffee break? ", but time as in "space and time." To the general public, the concepts of space and time as expressed by Einstein's General Relativity are very mysterious. "How can time be part of space itself?" "Does this mean time travel is possible?" and many similar questions are very popular for the public to ask. And then a few people think a little to hard and come up with ideas that are both amazing and amazingly wrong. The fact is that, except for very close to black holes, very close to the Big Bang, and across billions of light-years of space, time acts pretty normal on scales that matter to us. So when I talk about time below, remember that I'm talking about one of those three exceptions above, so things are going to get strange. Astronomers often say that we cannot know what, if anything happened before the Big Bang, the cataclysmic explosion that marked the creation of the Universe 13.7 billion years ago. (In some exclusive circles, the Big Bang is also known as the "horrendous space kablooey," though most astronomers are too uptight to use that seemingly pedestrian terminology.) 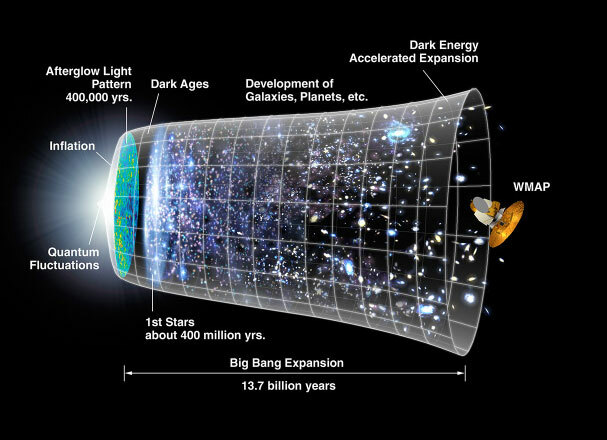 The Big Bang marked the beginning of time and space as we know it, so even asking the question, "what happened before the Big Bang?" is a little like asking, "why is a duck?" Just because we can ask the question doesn't mean it is a real question. If there was no time as we know it before the Big Bang, then asking what came before the Big Bang is a non-sensical question. If there was no time, there could be no before, no after, no present. Of course, there is still the pesky question of how the Big Bang came to be. Yesterday, in a weekly segment on Space.com called "Mystery Mondays," the article introduced some scientists who claim that, maybe, we can tell what happened before the Big Bang. Yes, I said "before." In their hypothesis based on intriguing but unproven ideas of gravity, there were versions of time and space before the Big Bang, just with greatly different properties than what exists in our Universe. Not only that, but these properties may have left a faint imprint on the Big Bang, which we might be able to detect in our own Universe. These properties would be very hard to detect -- the violence and space-time altering properties of the Big Bang would have erased most of these signatures. And, more to the point, as of yet the astrophysicists who are developing these ideas cannot even say what imprints these signatures might be, and how we could detect them and interpret them. So, what (if anything) should you take away from this? The main thing that is interesting to me is that it may be possible for humans to someday get an idea of where the Big Bang came from, which might mean there is more out there than just our Universe. Or, maybe this is not possible. We are dealing with almost pure conjecture, here. So, if you go up to your friendly neighborhood astronomer and ask about those things that happened before the Big Bang, don't be surprised if you get a blank look followed by a mumbled discussion about time not existing before the Big Bang. We really have no idea, and it may be centuries before we do. There are astronomers in Canada too, eh? Yesterday was Canada Day, a day when Canadians celebrate, well, being Canadian. It's kinda like Independence Day in the U.S., although the Constitution Act of 1867 that established Canada as a separate dominion did not completely sever British-Canadian ties in the way that the U.S. Declaration of Independence severed British-American ties. Still, it's a big holiday for Canadians, and a deserving day off of work. Although they rarely makes the news, Canadian astronomy and space sciences are a vital part of the world-wide science community. Canada has made many contributions to NASA, with the most visible being the robotic arm (Canadarm) used on the space shuttle and International Space Station. There are active astronomy departments at universities across Canada; I have worked with many astronomers who have worked or are still working at the Université de Montréal, the University of Victoria, the Dominican Astrophysical Observatory, and the University of Toronto, all of whom are tops in their areas of research. Canada is also part-owner of the Canada-France-Hawaii Telescope on Mauna Kea in Hawaii, one of the world's premier telescopes. Canada's National Research Council, the agency which provides most funding for Canadian astronomers, has a few unique policies that I rather envy. One is the requirement that those who use government money to produce a data analysis program need to provide that program (or access to the program) to the larger community. This is a nice touch --- many very useful analysis programs and data archives come from Canadian sources, and it is often impossible to get American scientists to share their data and programs, requiring us to re-invent the wheel when we want to emulate someone else's science. This open access does have its downside, as less-ethical people can take these programs and do the author's science while the author is busy trying to make the program user-friendly. It's a shame that these things have happened, and continue to happen. All in all, Canadians are a vital part of the worldwide astronomical community. I wish them all a (belated) happy Canada day!